Quartz crystal is what people think of when they hear the term “crystal. It is the most popular crystal with good reason. Quartz crystal is easily affordable because it’s quite common. If you could only have 1 crystal, I would recommend you choose quartz for the fact that it is good for just about any spiritual use. Quartz is believed to offer the following benefits to the bearer: good luck, energy, healing, protection, purification, clarity, guidance, wisdom, amplifies, stores, transfers and transforms energy. Quartz can be used to amplify thoughts and body energy. Quartz also brings forth clarity to one’s thoughts and allow one to influence the situation more effectively. Quartz crystal is considered a stone of power. It brings forth energy and harmonizes the flow. Quartz bridges a connection between the physical dimensions and that of the mind. It is believed to open communication with minerals, plants, animals and intelligent energies outside the physical realm. Quartz is believed to harmonize the flow of life energy between all life forms. Quartz crystal is a very powerful stone for facilitate communicate with spiritual and other worldly masters, teachers and healers. Quartz can create altered states of consciousness and can serve as a vehicle for reaching and utilizing abilities and talents of the mind. 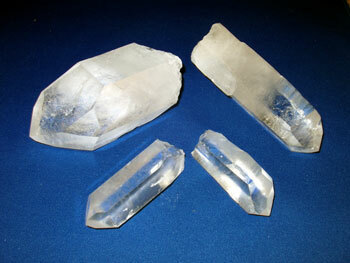 Psychic abilities are strongly stimulated and enhanced with quartz crystal. Quartz crystal is used in chakra healing to activate and energize the 7 major energy centers in the body. Quartz attunes nicely with the heart chakra as well as the 3rd eye chakra. Mediation can be improved by placing a quartz crystal on the 3rd eye. It helps one clear their mind and reach a “quiet place”. Quartz is also very effective for the crown chakra be enhancing clearing the way for Kundalini energy to flow. Quartz crystal is a purification stone. It offers purification of mental, physical and spiritual bodies. It can be used to transmute negative energy into positive and direct negative feelings towards positive happy ones. Large crystal (or crystal balls) create a healing energy in an area. When worn, quartz crystal offers a flow of energy as well as protecting the aura. Wear with the point up to bring wisdom and clarity. The same holds true at night, place a quartz crystal with the point towards the top of the head or crown chakra for clarity and wisdom. Aim the point toward your feet to help you calm down so you can get a good night’s rest. Quartz worn on the finger is believed the create “the Midas touch”. Quartz earring helps energize and balance the chakras. Keep a single quartz crystal on you or around your area to help maintain balance, energy and protection. Quartz will stayed attuned to the person to whom it is connected. A crystal pointing up channels energy to the upper chakras. Which means if you want to connect with spiritual guides or try astral projection, you would point your crystal towards you head. A crystal pointing downward has a grounding effect. This helps if you are feeling spacey or undecided on an issue. Holding a crystal in your receptive hand (the one you do NOT write with), will double the etheric field of the body. Quartz is used extensively as a healing stone. It not only allows one to diagnose, but also facilitates healing. I will cover the use and techniques of crystals in healing on another post as that is a vast subject in itself. Quartz crystal is believed to render negative energy powerless, destroy spells, curses and enchantments and dissolve black magic.